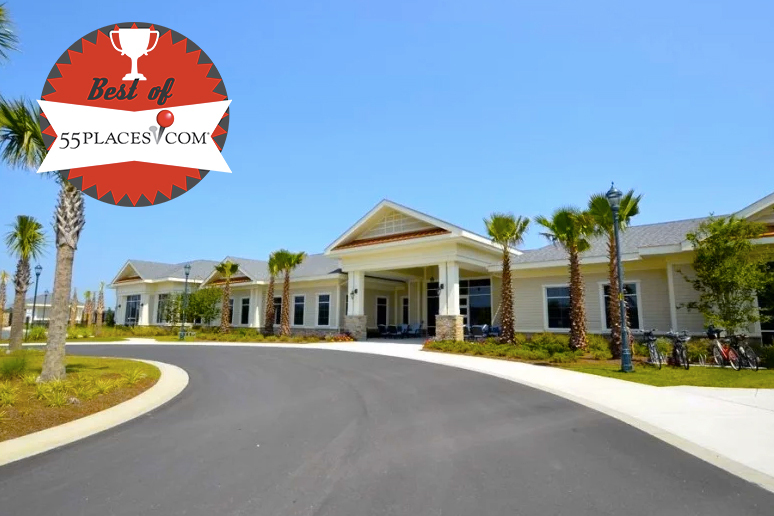 Del Webb Sun City Hilton Head made 55places list of the 55 Best 55+ Communities. And while everyone has a different interpretation when referring to something as the “best,” we also use objective measures when compiling this list. We used analytical data gathered on 55places.com that helped determine which communities were the most popular on our site. The data measured the number of visitors to each community page on our website, our in-person visits, and objective rankings in eleven distinct categories to determine which communities stood out from the rest. With this approach, we were able to compile an objective list that would include the best active adult communities in America. As you read through this list, you may find a few new communities that made it to the top of the list this year, while others have dropped a few spots or have been completely replaced. It’s also important to know that while our list is compiled with objective data, it doesn’t take into account the personal needs and requirements of every active adult. But we hope that this list helps you research and find your ideal active adult community that fits your lifestyle and needs. Check out this year’s 55 Best 55+ Communities! Sun City Hilton Head gained the top spot on this year’s list thanks to its impressive resort-style amenities, home designs, social environment, and prime location in Coastal South Carolina. Since 1995, this age-restricted community has been one of the most highly acclaimed active adult communities in the country and features sprawling grounds that include a 45-acre Town Center and Amenity Complex, multiple sports courts, and 54 holes of golf. And with more than 200 chartered clubs and interest groups, residents have endless options for socialization and recreation while living in Sun City Hilton Head. The Villages in Central Florida has been featured on this list for many years. As the largest active adult community in the country, spanning across three counties, three zip codes, and over 20,000 acres, The Villages has something for everyone. Operating as a self-sustaining town that will consist of more than 56,000 homes, The Villages has countless world-class amenities including multiple top-notch recreational centers, lush golf courses, sparkling pools, sports courts, shopping centers, and social clubs. With resort-style amenities, affordable homes, and a vibrant social atmosphere, it’s easy to see why so many retirees flock to this popular active adult community. Robson Communities opened SaddleBrooke in 1986 and plans to build 4,589 homes at completion. This active adult community, which is situated at the base of the Santa Catalina Mountains that provides breathtaking views, features an award-winning lineup of resort-style amenities, social clubs and activities, and quality built new and resale homes. Residents enjoy the community’s several large clubhouses, state-of-the-art fitness facilities, and outdoor recreational areas including 63 holes of spectacular golf, miles of scenic walking and biking trails, and a variety of pickleball, tennis, and bocce ball courts. SaddleBrooke in Tucson not only keeps residents active, social, and healthy, but it also provides a great location in Southern Arizona where they can enjoy the city’s attractions and entertainment along with the area’s outdoor natural beauty. This beautiful 55+ community in Georgetown, Texas offers active adults a vibrant lifestyle along with affordable homes and world-class amenities. Del Webb began construction of this age-restricted community in 1995 and plans to build 9,900 homes upon completion. As the largest 55-plus community in the state, Sun City Texas continues to be a renowned active adult community thanks to its two well-appointed amenity centers that feature an on-site restaurant, multiple indoor and outdoor swimming pools, three 18-hole golf courses, and plenty of recreational facilities. Sun City Texas’ prime location in Central Texas also allows homeowners to have easy access to nearby popular cities like Austin for additional entertainment, shopping, dining, nightlife, and attractions. Located in Ocala, FL, which is known as the “Horse Capital of the World”, On Top of the World provides retirees with a beautiful and tranquil setting that consists of rolling hills and ancient oaks, creating the perfect active adult environment. This age-restricted community was opened in 1981 and will host more than 10,000 homes at build out. Homebuyers can choose from new or resale homes that provide a maintenance-free lifestyle. Within the community’s gates, residents enjoy a rich lineup of resort-style amenities, abundant social activities and affordable home designs. The community features several clubhouses, three 18-hole golf courses, fitness centers, swimming pools, tennis courts, restaurants, and an R/C airplane field and R/C car track. Residents have access to more than 200 clubs, which continue to make On Top of the World a popular and exciting active adult community in Central Florida.